On Wednesday … Canon Patrick Comerford is the guest lecturer of the Irish Hellenic Society in the United Arts Club, Upper Fitzwilliam Street, Dublin, at 7.30pm, when he will discuss Sir Edward Law (1846–1908): the Irish Philhellene who rescued the Greek economy in the 1890s. Law is buried in Athens and is commemorated in both a street name in the Greek capital and in a memorial plaque in St Patrick’s Cathedral, Dublin. It is always interesting when a one-country holiday becomes a two-country holiday. When two of us were in Rome earlier this year, we also crossed in and out of the Vatican City, which is recognised internationally as a sovereign independent state, despite in its size and population. San Marino, officially the Republic of San Marino (Repubblica di San Marino), also known as the Most Serene Republic of San Marino (Serenissima Repubblica di San Marino), is a microstate that is an enclave, and it too is totally surrounded by Italy. 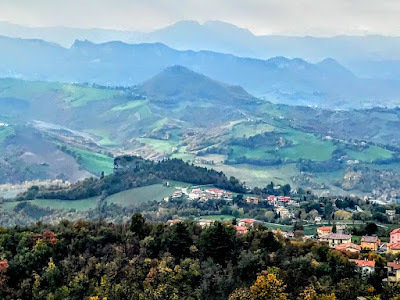 We caught an early morning train from Bologna to Rimini on Friday [17 November 2017], and by mid-morning we were on top of Monte Titano in San Marino. The other microstates in Europe – Andorra, Liechtenstein, Monaco and the Vatican – are monarchies of one sort or another, and are dependent on their nearest, biggest and most powerful neighbours for their survival. Like them, San Marino is not a member of the European Union. On the other hand, San Marino, claims to be the oldest surviving sovereign state in Europe and the oldest constitutional republic in the world. San Marino’s territory is about 61 sq km (24 sq miles), and it has a population of 33,562, the smallest population among all the members of the Council of Europe. The economy of San Marino relies mainly on finance, industry, services and tourism. Yet this is one of the wealthiest countries in the world in terms of GDP (per capita), with a figure comparable to the most developed European regions. San Marino has a highly stable economy, with one of the lowest unemployment rates in Europe, no national debt and a budget surplus. It is said to be the only country with more vehicles than people. The capital is the City of San Marino and the largest urban area is Serravalle. San Marino takes its name from Marinus, a stonemason originating from the island of Rab, in modern-day Croatia, who founded an independent monastic community on Monte Titano in 301 AD. This is given as the official date of the founding of the Republic. San Marino has limited public transport facilities. There is a regular bus service between Rimini and the city of San Marino that is popular with both tourists and workers commuting to San Marino from surrounding Italy. The bus stops at about 20 places in Rimini and inside San Marino on the journey between the train station in Rimini railway station and the bus station in San Marino. 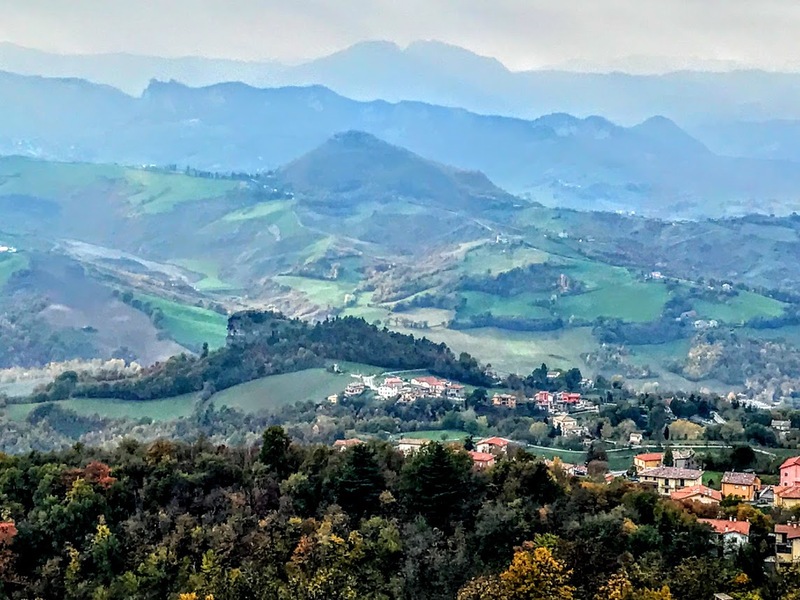 A 1.5 km cable car also connects Borgo Maggiore at the bottom of Monte Titano and the City of San Marino at the top of the rocky mountain. The cable car was not running this this week, but the tourist office beside the terminal in San Marino was open, offering €5 tourist visas. The visas cost as much as the bus journey from Rimini, but are not necessary. Should I have got my passport stamped? I certainly did not need a visa. San Marino has an open border with Italy, there were no checkpoints the bus crossed the border, not just once but twice on each leg of the journey, and I had travelled along most of the roads through this tiny republic, and walked the streets of the old town before I reached the tourist office. But did I want a visa? I had brought my passport, but ought I pay for a visa I did not need? There are very few countries I travel through these days that bother to stamp my passport, even when they demand to see it. Switzerland is outside the EU, but has never stamped my passport. 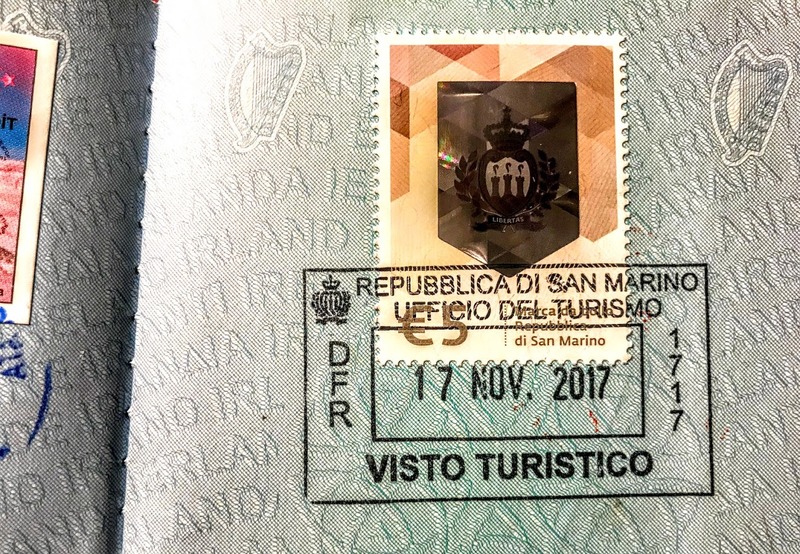 I had walked in and out of the Vatican City and through Saint Peter’s Square a few times this year … but no-one ever asked for my passport, let alone offer to stamp it. Britain may soon leave the EU, so I may be confused about which queue to join at an airport; but they are hardly likely to reintroduce passport stamps. The only European country that bothers to stamp my passport these days is Turkey, and that is probably because it earns a hefty amount of foreign currency by charging tourists for visas. The only other stamps on my present passport are from a visit to the US many years ago. A heavily-stamped passport is a rarity for EU citizens these days, even those of us who think we are well-travelled. Of course, it could be costly filling a passport too quickly. At one stage in the 1990s, while I was working as a journalist, I had to apply for – and pay for – a second passport. 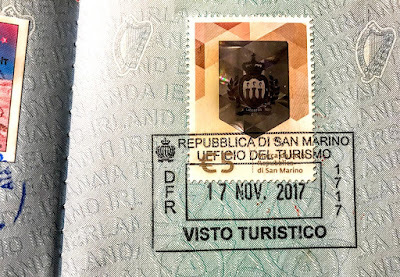 Friday’s stamp in San Marino says goodbye to another visa page in my passport – five gone, 23 to go. Oh well, I’m sure this one is going to last until it’s due for renewal in 2019. Afterwards, we had lunch at La Capanna restaurant, looking over the rocks of San Marino and across to the Adriatic coast of Italy. The view was worth it, whatever about the visa. We were back in Rimini by mid-afternoon, and in Bologna in time to go out for dinner.